A team of international archaeologists is working round the clock to rescue the wreck of what is thought to be a 16th Century Portuguese trading ship that lay undisturbed for hundreds of years off Namibia's Atlantic coast. The shipwreck, uncovered in an area drained for diamond mining, has revealed a cargo of metal cannonballs, chunks of wooden hull, imprints of swords, copper ingots and elephant tusks. It was found in April when a crane driver from the diamond mining company Namdeb spotted some coins. The project manager of the rescue excavation, Webber Ndoro, described the find as the "the most exciting archaeological discovery on the African continent in the past 100 years". 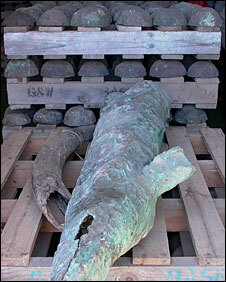 "This is perhaps the largest find in terms of artefacts from a shipwreck in this part of the world," he said.